Does Great Continuity Really Equate to Early Season Success? Every season pundits and commentators often gush about the importance of team continuity and experience. The teams who return the most players, the thinking goes, are those that will transition most seamlessly into the new season. The teams that are integrating a bunch of new freshmen and transfers, by contrast, aren’t as likely to play up to their full potential before the new year. But is this maxim, repeated by so many inside the game, actually true? Is there data to support it? KenPom recently developed a new statistic called minutes continuity, which measures “what percentage of a team’s minutes are played by the same player from last season to this season.” This allows us to analyze whether teams with greater continuity overachieve at the beginning of the season and teams with lesser continuity underachieve. While it is possible that most any preseason ranking mechanism (including KenPom) would already account for player continuity, any positive effect would most likely be exhibited in the first half of the season. The teams with more continuity would benefit earlier while the teams with less continuity would catch up as the season wears on. To determine if this is true, we examined team performance versus preseason expectation in two groups (based on Pomeroy’s list (paywall)): the 40 teams with the most continuity, and the 40 teams with the least continuity. The American Athletic Conference opened with 11 contests featuring league squads over the weekend — including two victories for Cincinnati and an easy win for the AAC’s only ranked team at the moment. While exceptionally early, it’s never too soon to make some initial observations. Here are five such thoughts from over the weekend. UConn, Cincinnati and SMU are the Teams to Beat: Since the American’s existence as a conference, there has been a clear divide between the top and bottom halves of the league. From this weekend’s results, it appears as if there will be a clear divide between the top three teams and the rest of the conference. UConn, Cincinnati and SMU did exactly what was expected of them — which was to roll over their weaker opponents. It will be interesting to see how these three teams fare as they play some tougher non-conference teams in the coming weeks. With the start of the college basketball season upon us, we figured it would be a good time to bring back the Morning Five. We apologize for the infrequent nature of these posts the past few months, but we had to deal with a variety of things the past few months (all good). Now that the season is starting we are planning on doing these posts at least a few times a week. If you have not been on the site in a while we encourage you to check out the great work that our microsites have been doing. And if you are in the mood to try something different this season (and potentially win tickets to one of the NCAA Regionals this year), we encourage you to enter into our Survivor Pool. Unlike some other sites, we are not being investigated by any Attorney Generals, you don’t have to pay any money to enter, and we don’t use insider information to try to win our own event. We often talk about college sports being essentially separate entities from the educational institutions that they represent, but there are many instances in which they are intertwined. One excellent example of this is the Washington–Texas game that is being played in Shanghai. Many will view this as a way for the basketball teams to grow their brand and possibly even that of the conferences, but the schools also view it as an opportunity to promote their schools as educational options for people overseas. Financially it makes sense for schools to go after individuals who might pay hundreds of thousands of dollars in tuition money instead of hoping to sell a bunch of $20 t-shirts. Although the season is officially starting tonight there are a handful of notable players who are still in NCAA eligibility limbo. The most significant of these is Cheick Diallo, the highly touted Kansas freshman. We won’t claim to have any inside information/knowledge about the case, but Sam Mellinger’s column on the situation and his proposed solution is a worthwhile read while we wait for the NCAA to hand down a decision. As Mellinger notes the blame here shouldn’t fall as much on the NCAA as it should on the member institutions that allowed it to have this type of unregulated power. Diallo appears content to wait for the NCAA to make a decision, but two other players (I guess they are technically just students now) have received negative rulings from the NCAA and in a somewhat unique move appear to be ready to call the NCAA on it by threatening lawsuits. Parties representing Central Florida freshman center Tacko Fall and St. John’s freshman Marcus LoVett have both reportedly looked into filing lawsuits against the NCAA. This might sound interesting on paper, but we doubt it will end up doing either athlete much good in the near-future because of the glacial pace that the NCAA and the court systems that deal with its cases move at for these type of things. Finally, we have been off long enough that we never addressed the Louisville prostitution scandal and it looked like we might be able to avoid the topic since the administration at Louisville obviously doesn’t care about how poorly the situation reflects on the school, but we probably could have figured that out with the way they have handled numerous other things. Now it appears that the school may end up having to deal with the NCAA as Katina Powell, the individual who allegedly supplied the program with the prostitutes, will meet with the NCAA next week in reaction to the high likelihood that she will face criminal charges. Given the way the NCAA usually deals with these things we doubt that they will do anything to the program, but it will be interesting to see if Rick Pitino ever decides that it would be best to move on rather than have to deal with this scandal for the foreseeable future. UConn do-it-all guard Ryan Boatright looks like he might run away with AAC Player of the Year honors this season, but when it comes to determining whether the Huskies will make the NCAA Tournament, it will ultimately be the play of running mate Rodney Purvis who makes the biggest difference. Let there be no debate that Boatright is the best and most important player on the team, but the senior isn’t the offensive player Shabazz Napier was and he doesn’t have a running mate as good as he was as Napier’s complement last season. Rather, Boatright is a skilled but flawed offensive player who cannot shoulder the burden by himself, as evidenced by the team’s overall ugly offensive efficiency numbers. And after getting a chance to watch the Huskies play in a road loss to Stanford last week followed by a win over UCF and a man-handling of South Florida last weekend, it is clear that Purvis is the player most capable of lending Boatright a hand. 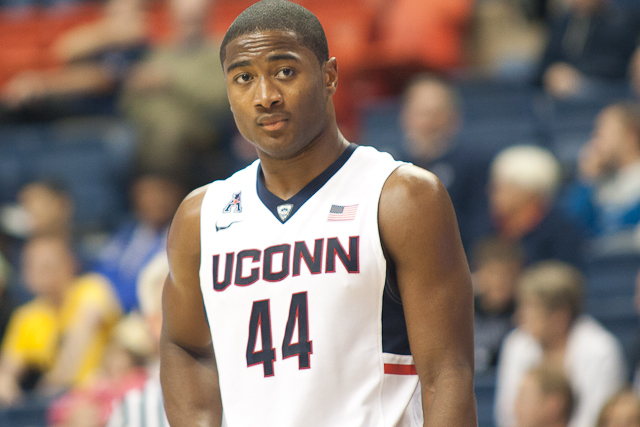 Rodney Purvis’ Offense Is UConn’s Key To Returning To The NCAA Tournament. His performance this season has in many ways been a microcosm for what has plagued UConn all season long, though — consistency. 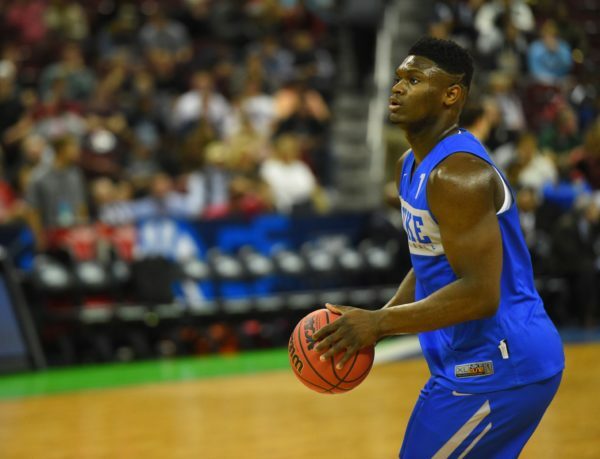 The NC State transfer has only scored 10 or more points in back-to-back games once this season (against Columbia and Central Connecticut State), and even within the flow of games, Purvis can frustratingly flit in and out of focus. At times last week against the Cardinal, Purvis looked unstoppable. He bullied his way to the basket whenever he felt like it; he made a few contested jumpers over smaller defenders look easy; and despite making just one of his five free throws, his aggression helped teammates get open looks. When the final horn sounded, he had logged 14 points on 6-of-8 shooting and the rest of the Huskies had managed just 45 more points in their second straight loss. The team’s offensive funk reached its low point during the second half, and Purvis was seemingly content to fade into the background as Boatright forced floaters in the lane and Amida Brimah tried his luck in the post. Purvis has UConn’s best combination of size and athleticism on the court, and Stanford had absolutely nobody who could effectively guard him. And yet he was a veritable ghost in the second half. He followed up the disappointing Stanford performance with an ugly eight points on 3-of-8 shooting in an equally ugly win over UCF after that, and then looked like a man reborn last Sunday against South Florida as he went for 17 points, including 8-of-12 from the charity stripe and abused whichever poor player drew the unlucky assignment of guarding him. It’s been a while since a morning roundup has appeared on our fine microsite but we are bringing it back as a regular feature. We start in Dallas where, in the only conference game last night, SMU walloped Memphis, 73-59, and it was never really close. Things are getting so bad in Memphis that coach Josh Pastner is actually trying to pretend that saying things like this makes sense. We should also note that Tigers’ forward Shaq Goodwin must see Mustangs’ forward Markus Kennedy in his nightmares, because Kennedy has eaten him for lunch every time the two teams have squared off. In the three meetings between the two all-conference caliber forwards, Kennedy has averaged 18.3 points and 6.0 rebounds per game (including 21 points on 10-of-13 shooting last night) while Goodwin has averaged 4.3 points and 3.0 rebounds per game. The Tigers will get one more crack at Kennedy and the Mustangs at home, but they have too much to fix between now and then to be looking that far ahead. Unfortunately for Memphis, last night’s loss was just the latest bit of disappointing news coming out of the program, as sophomore forward Kuran Iverson has washed himself in drama thanks to his lack of a social media filter. To recap: Iverson got caught retweeting criticism about his head coach and one day later was suspended for at least two games. He sat out last night’s game but folks in the know seem to think that Iverson has played his last game as a member of the team. Once perhaps the Tigers’ most promising recruit, Iverson has struggled to stay on the floor and has been a total dud for the better part of two seasons. It would be one thing if he was having a breakout season and felt the need to criticize his coach, but all he has really proven he can consistently do on the basketball court is turn the ball over, so I don’t think Pastner will lose any sleep if Iverson and the program cut ties. I wouldn’t go as far as to call UConn‘s start to the season a disappointment, but it’s safe to say that Huskies’ fans were hoping for better results thus far. 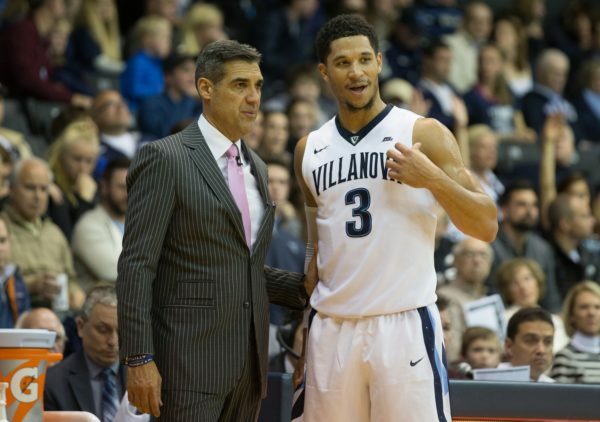 The good news is that the Huskies have barely scratched the surface of their potential and now, finally, with a full complement of players, coach Kevin Ollie has some depth and flexibility to work with. Just getting everyone healthy won’t be enough, though, as almost everyone on the roster other than Ryan Boatright has been wildly inconsistent this season. But as long as the injury bug has passed and all of his players stay eligible, this team will continue to get better as conference play wears on. There should be little doubt that the Huskies remain one of the favorites to win this conference. 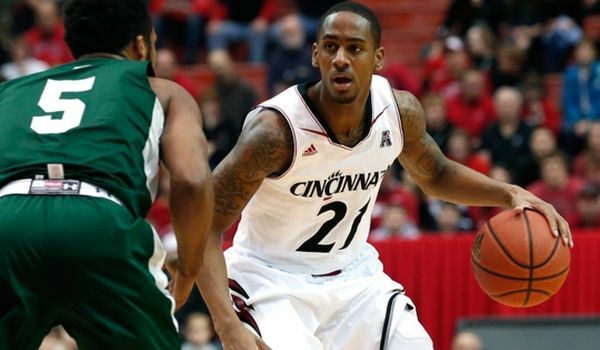 Earlier this season, Cincinnati coach Mick Cronin was quoted as saying that freshman forward Gary Clark had offensive rebounding instincts “in his DNA” and thus far Clark has proven his coach prophetic. The Charlotte native not only ranks second in the AAC in rebounding, snagging almost eight caroms per game, but he also boasts one of the 35 best offensive rebounding percentages in the entire country. He is quietly having one of the best freshman seasons in the conference and has put himself in elite company when it comes to former Bearcats’ greats. His offensive game needs further development, however, as almost all of his points are a result of his yeoman’s work on the offensive glass, but once again Cronin and his staff have unearthed a gem and turned him into seemingly the next great two-way forward for the program. This has been pointed out ad nauseam elsewhere but there have really only been two bright spots for UCF this season: freshman guard Adonys Henriquez and classmate and fellow Orlando native B.J. Taylor. Each would be front-runners for the all-Freshman team in the AAC and both are legitimate candidates for Newcomer of the Year in the conference as well. A big reason why they have been so good is because they have been downright lethal from behind the three-point arc. The pair aren’t just one of the best shooting freshman combinations in the conference, they are one of the best shooting combos in the conference, period. Henriquez is second in the conference in three-point shooting and Taylor is just one spot behind his friend. Both are shooting better than 40 percent from behind the arc and contribute in other ways as well. Despite how bright their futures are, I’m not sure it is bright enough to save head coach Donnie Jones’ job, which is a bummer for Jones, because the new coach will be inheriting some serious talent if he does get canned. “Bests and Worsts” is a new Monday feature where we will recap the best and worst from the previous week of college basketball in the AAC. It was not a great week for the AAC as all of the expected top teams in the conference lost in uninspiring fashion and the conference still doesn’t have a marquee win to hang its hat on — unless you count UConn beating Dayton. But we never pretended that the AAC would be the best conference in the country, just that it would be an entertaining season to follow, and that much still holds true. While other conferences have seen teams emerge from the pack, the American is still totally up in the air and that’s what makes it interesting for us to cover. Best Reason for UConn Fans Not to Panic: UConn basketball fans aren’t quite as unhinged on Twitter as say, Kentucky fans, but they can be pretty active. So obviously it wasn’t long after UConn‘s disappointing loss to West Virginia in the final of the Puerto Rico Tip-Off that the Huskies’ faithful started speculating on what the loss meant. The Huskies were very bad from downtown (3-of-17) and turned the ball over a lot (19), but the tweet that best summed up how UConn fans should feel about the loss came from our friends at the Bleed Blue Blog. Nothing proves a point better than some well-placed snark. 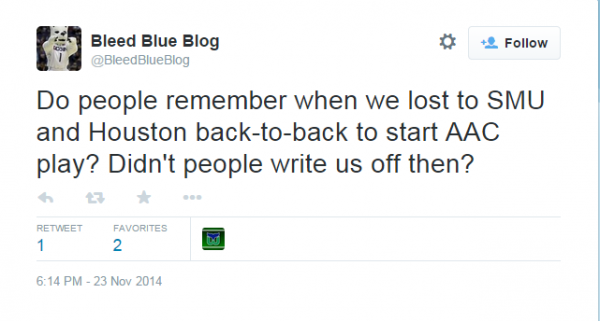 Also, Bleed Blue makes a larger point, even if they weren’t trying to. 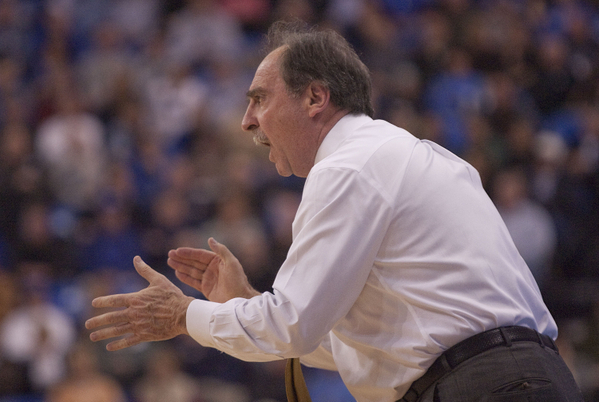 It’s easy to overreact to early season games because there is nothing else to go on. But none of the teams around the country as anywhere near as good as they will be in January and February, so reading the tea leaves of an early-season loss to West Virginia isn’t the best way to evaluate the Huskies’ chances of repeating.